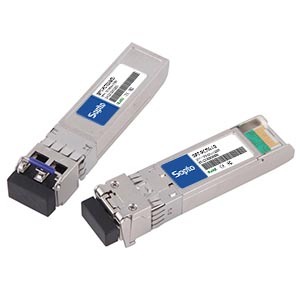 SOPTO CWDM SFP+ transceiver is small form factor pluggable module for bi-directional serial optical data communications such as IEEE 802.3ae 10GBASE-LR/LW/ER/ZR. It is with the SFP 20-pin connector to allow hot plug capability. Digital diagnostic functions are available via an I2C. This module is designed for single mode fiber and operates at a nominal wavelength of CWDM wavelength. There are 18 center wavelengths available from 1270 nm to 1610 nm, with each step 20 nm. A guaranteed minimum optical link budget of 14 dB is offered. The transmitter section uses a CWDM multiple quantum well DFB/EML laser and is a class 1 laser compliant according to International Safety Standard IEC-60825. The receiver section uses an integrated InGaAs detector preamplifier (IDP) mounted in an optical header and a limiting post-amplifier IC. Worked perfectly in my project, will come back next time. Excellent quality, fast delivery and easy to find on website. Return client whose very pleased with their consistent high level of service and support. their professionalism continues to impress us. I absolutely recommend for your IT needs. So happy to have found this product. really good . I received the order exactly on the estimated date. I am very much satisfied with the delivery. Worked as designed. Turned a SFP port into a gig copper port. Good service, fast delivery.